Student explorers on Upstate excursion wanting a quintessential Niagara Falls history lesson won’t want to miss a stop at this favorite educational attraction in landmark destination Niagara Falls State Park in New York. From your choice of 314 “best seats in the house” your group is regaled with fascinating Falls legend and history that would take more than a lifetime of dedicated adventuring to amass. Hold onto your hats as “Legends of Adventure” comes whooshing to life on a 45-foot screen while the deafening, thunderous and unmistakable roar of the iconic Falls is delivered through digital Dolby surround-sound. 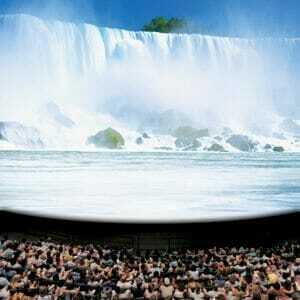 Plunge head-first into all the mist, myths and mysteries of one of the most storied natural wonders of the world during this spectacular 40-minute presentation showing hourly at the Niagara Adventure Movie Theater located on the bottom floor of the Niagara Falls State Park Visitor Center. Complimentary headsets for French, Spanish, Mandarin Chinese, Japanese, Korean and German languages and wheelchair accessible seating are available.